Sentosa is Singapore’s most popular island resort whose attractions include a man-made beach, golf courses, and of course, Universal Studios Singapore. I had been here once, but unfortunately had to go back since all my photos from my 2007 trip went down the drain when my first laptop bugged down. I took the MRT in getting here and alighted at the HarbourFront Station. From there, I transferred to Sentosa Express, which is located at the 3rd level of VivoCity. Click HERE for the complete guide on getting to and around Sentosa. My first stop was at the beachfront where these signs amused me. Lining the beachfront are some restaurants and because my tummy was already grumbling, decided to take brunch. I found this restaurant inviting because of its laid-back ambience and proximity to the beach. I ordered French Toast ($14) and ever the dessert person, added Banofee Tart ($8) to my meal. While waiting for my food, I took in the view of the beach and found this bird hopping from one table to another while looking for food. I couldn’t be sure, but this may be a blackbird. Service was a little slow and from my beachfront seat, had to go the counter/cashier to follow up on my order. When my food finally arrived, I happily dug in. Though described in their menu as French bread coated in egg, served with crispy bacon, maple syrup and sunny side up egg, the bacon wasn’t as crispy as I would have liked and the egg was too well-done it tasted rubbery. Banofee Tart had a thumbs-up and a chef’s toque signs on the menu, but I found it disappointing despite its being highly recommended. The crust/pastry tasted plain and the chocolate was too dark for my taste and too compact. Their description was also misleading. It says, “Caramelized banana and toffee served in sweet pastry,” but the bananas were not caramelized but fresh. Good thing there was the view to compensate for my disappointing food. This lies on the west portion of Sentosa and is known for its iconic Siloso signage as seen on the first photo of this post. It is a venue for beach volleyball and other outdoor activities like skim boarding, mountain biking, and canoeing. Honestly, I found the beach too man-made, though it’s now bigger compared to what I saw in 2007. This is a replica of Singapore’s Merlion. The lion depicts the folklore of Prince Sang Nila Utama’s rediscovery of lion (singa) and city (pura) while the fish tail symbolizes the ancient fishing village of Temasek, meaning sea in Javanese. At 37 meters, the Merlion in Sentosa is bigger than the one found in Merlion Park. There’s a stretch of colorful stretch of fountains when I climbed up the Merlion and walked along the Merlion Walk. This features Singapore’s history as told in multimedia displays, multi-screen theater presentations and life-sized tableaus. As I was pressed for time, I did not get to linger here. This features interactive exhibits. I did not see this in 2007 so I got curious but what I found here was something that will appeal to children, not adults like me. I love butterflies and because I have fond memories of my previous visit here, I decided to come back. There were more butterflies now than before. It’s difficult to photograph most of them though, since they kept on fluttering their wings. These blue and green butterflies were the most active and elusive. At the slightest movement, they would fly away thus the blurry shots of their wings. I don’t know what this is called, but it seemed the butterflies especially these orange and black species were especially attracted to it. On this particular visit, one memorable experience for me was of holding this butterfly. Compared to other species who would take flight at the slightest movement, this one settled on my fingers for quite sometime. Aside from butterflies, there were birds too. I was actually wondering why there was a toucan and a hornbill in the Butterfly and Insect Kingdom. Perhaps it was to further entertain their visitors since they even had this macaw that could perform tricks. This blue bird fascinated me so much so I kept on following it. As I write this post, I googled Blue Bird with Crown and identified this as a Victoria Crowned Pigeon. Some birds were perched high on tree branches so I just contented myself with taking zoomed-in shots of them. There was an Indian Star Tortoise too and an Iguana. Some would even pet the iguana and have their pictures taken while they did so. To get to the exit, I had to pass by their creepy crawlies section. I don’t remember these many live creepy crawlies from my past visit so these must be new additions. Scorpions, tarantulas, stick insects… there were many of them. My most interesting find here is the Flower Mantis because it looked so dainty. Aside from live insects and whatnot, there were framed insects and butterflies too. After I exited the Butterfly and Insect Kingdom, I chanced on this beautiful peacock. I once saw a peacock in Palawan, but it was caged, so it was nice to see this beautiful creature freely roaming Sentosa. Too bad it did not spread its fan despite the prodding of its eager audience. I wanted to explore more and even ride the Tiger Sky to get a panoramic view of Sentosa, but it was closed because it rained. Sigh. Here are some random photos taken at Sentosa. As it was already 5 PM and I had to meet a friend and 7 PM, I had to leave Sentosa. By this time, it was raining so hard. Here’s a photo of my view when I rode the cable car back to Vivo City. I’ll end this post with photos of interesting flora that I found in Sentosa. I did my best to google their names but can only identify the palm tree with red fruits (center upper photo) and the Bengal Trumpet (lower right photo). Lastly, here is my favorite photo from this set. My apologies, since I could not identify either the butterfly or the plant that it’s in. PS: There are more attractions to explore in Sentosa than what I covered on this blog. Since this was my second visit, I chose only those that I liked to re-visit. That and the fact that it rained, which kept me from discovering more of the place. Also, I specifically skipped some attractions and even Universal Studios since when I went to the US, I already visited the Universal Studios in Los Angeles. This entry was posted in Travel, Uncategorized and tagged Butterflies, Coastes, Flora, Sentosa, Siloso Beach, Singapore on December 1, 2014 by milai. This photo was taken in New York’s Battery Park. I was there the summer of 2012 and was amazed with its garden. It was my first time to see this particular butterfly and pink flower as I do not see them in the Philippines. 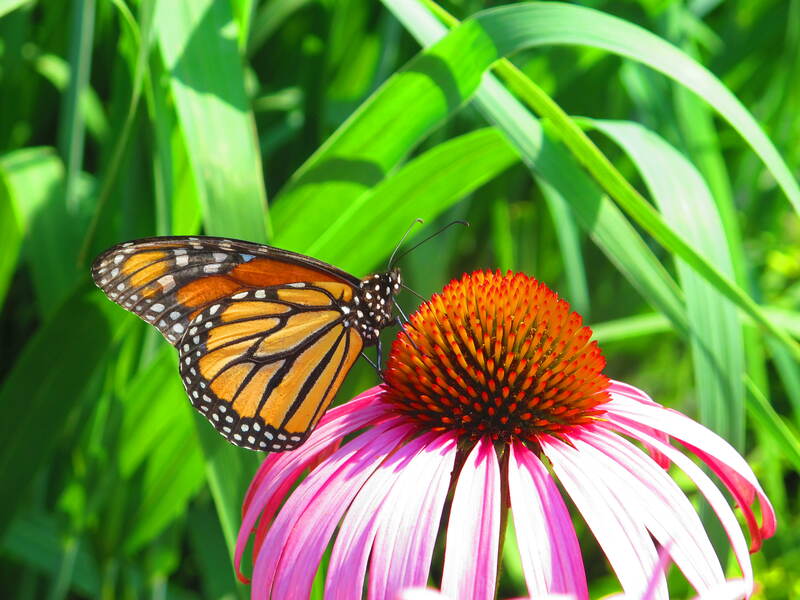 Thank heavens for Google as I was able to identify them as a Monarch Butterfly (Danaus plexippus) and a Purple Coneflower (Echinacea purpurea). Aren’t they lovely? This entry was posted in Snapshots, Travel and tagged Butterflies, Flowers, New York, Outdoors, US Trip on November 9, 2012 by milai.